Every bulletin board needs fun Valentine's Day inspiration, brought to you by Worthington Direct. Valentine’s Day is always a blast at school! That’s why we put together these fun craft ideas, to inspire teachers and make the day even more fun for the kids. This bulletin board theme is absolutely adorable, and perfect for those teachers with a class full of crafty students. Begin by giving each child in the class a paper plate and cut-out hearts to create their fish. Let the students decorate their fish using paint, markers, glitter, stickers, or anything else you deem appropriate. Hang the fish on the board along with a few aluminum foil “fishing hooks” attached to some yarn “fishing line.” Add the words “I’m Hooked on You!” for a super cute board your class is sure to love. 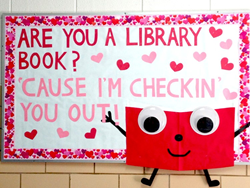 Check out the rest of the Valentine's Day inspired bulletin boards for your classroom here! At Worthington Direct, you will find over 10,000 quality furniture products for your school, church, daycare or office. Our goal is to make your purchasing job easier by giving you direct access to competitive prices on all types of commercial and institutional furniture products. Worthington Direct has been in business 19 years and is staffed with knowledgeable sales associates that average 10-20 plus years experience in the furniture supply industry.